Real men can wear pink without feeling sissified. Another case of me just playing around with my markers. I actually wanted it to look more flat, but his skin looked too flat against the white background, so I ended up adding shadows. Why is he in pink? I have a thing for men who's masculinity isn't that easily challenged. 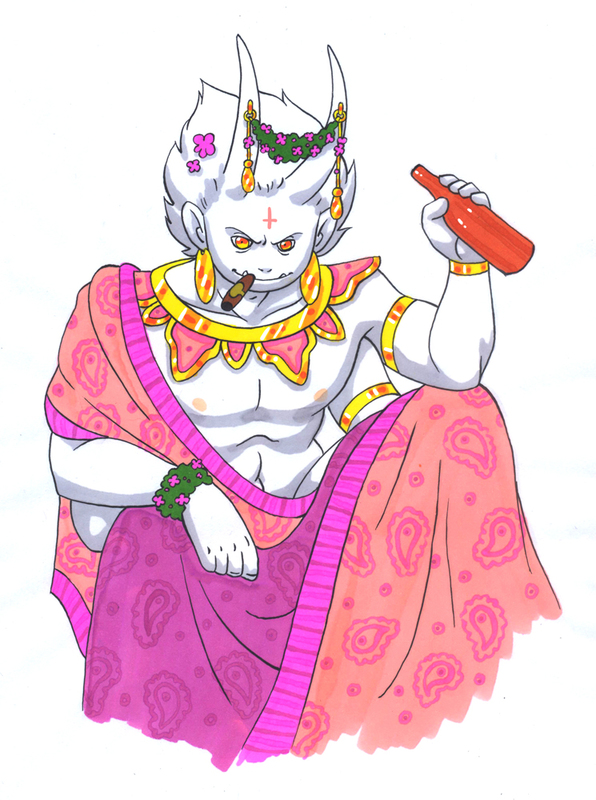 Besides, he's an Indian demon, and in India pink is not considered a feminine color, nor are flowers seen as girly. It is however seen as a symbol of being in love, so maybe he is dressing up for Nini? Though in Japan pink is a feminine color, so Nini might stop up for a second to look confused at him. Anybody mocking pink look at Jacob and all his manly awesomeness and feel shame. @SuperAleksei: True that. Real men wear pink. Jacob is an example, as well as Donovan Deegan. Go ahead, call him a sissy to his face. I dare ya! I love how you play around with the different cultural stereotypes. And yes, he totally makes pink work for him.